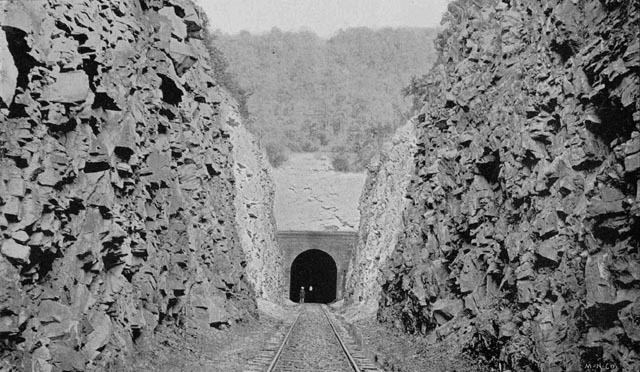 very unlikely that John Henry raced a steam drill at Big Bend Tunnel. happened at Big Bend - they would have known about it if it had. (which lies along the southeastern edge of Birmingham, Alabama). through a mountain with a name similar to "Cruzee" or "Cursey." Bend, in his unsuccessful pursuit of John Henry. Crystal Springs, Mississippi, after the Civil War. publication of the article I have learned that one of P. A. L.
Mountain Tunnels, which are two miles apart, portal to portal. even spelled that way in some old documents. lend credence to the testimonies of Spencer, Barker, and Cummings. very close to Crystal Springs, south of Jackson. old and strong as that for Big Bend. 1895, this system will be known as the Central Railway Company." To read the full article, "Chasing John Henry in Alabama and Mississippi," contact the Alabama Folklife Association and order a copy of Tributaries: Journal of the Alabama Folklife Association, Vol. V (2002).